A month or two ago, I read a blog post somewhere on low-maintenance gardening, and one of the tips was to avoid self-sowing plants. I’ve been pondering that ever since. In many ways I agree wholeheartedly, especially in the case of self-sowing perennials. Being confronted with thousands of bronze fennel or hundreds of golden lemon balm seedlings can do that to a person. (To be fair, I completely accept the blame for that; if I’d have spent just a few minutes deadheading them last year, I would have saved hours of weeding them out now.) When it come to annuals, though, I consider the self-sowers to be some of my most valuable time-savers. Granted, self-sowing annuals too can be overgenerous with their offspring, which does entail some extra weeding time with a full-size or hand hoe. And that weeding can get time-consuming, as you try to figure out which seedlings are the good guys and which are the weeds. I’ve learned not to be too quick to do my spring weeding, because telling them apart is much easier when the seedlings are several inches tall. On balance, though, self-sowing annuals save me a lot of time. They come up when they’re ready, saving me the trouble of starting them indoors, pampering and potting them up, and then planting them out. With so many other seeds that *do* need that extra attention, anything that’ll sow itself is golden in my world. Self-sowers save money, too, because they fill space that I’d otherwise have to buy or grow stuff to fill. And from an aesthetic standpoint, self-sowers offer several benefits over transplants. For one, the self-sowers often grow more steadily and are more vigorous in the long run, I guess because they never have to deal with root disturbance from transplanting. It’s true that they can take some weeks longer to come into bloom than their jump-started indoor-sown counterparts, but I consider that a good thing, because they’re just coming into fresh bloom at a time when earlier-started gardens are looking tired. Best of all is the way that self-sowers create some phenomenal combinations, putting themselves in places that I’d never even consider. A sunflower right at the front of a border? A mass of verbena laced through tightly planted ornamental grasses? Sometimes they come up in tough sites where I couldn’t or wouldn’t even dream of trying to squeeze them in with a trowel. With a mostly hands-off approach, tempered by a little editing on the gardener’s part, self-sowing annuals are some of the most brilliant designers around. So, to celebrate the return of the plants that can save me time, save me money, and make me look like a really good gardener, too, I’m sharing a top-10 list of my favorite self-sowing annuals. 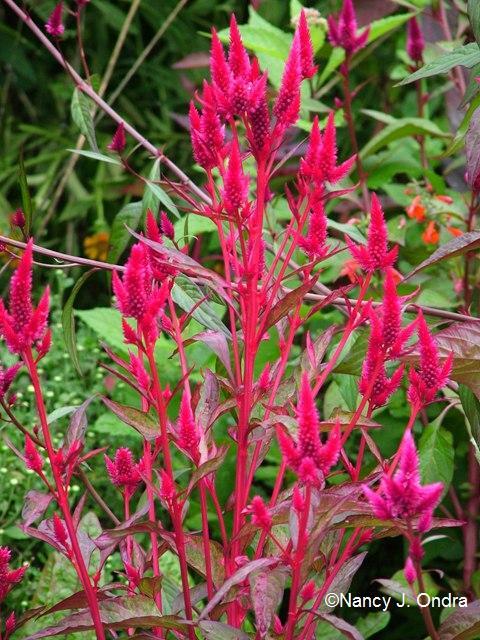 Celosia – primarily the plumed types, since I don’t seem to be able to grow the cool crested kinds. This one showed up where ‘Punky Red’ and ‘Wine Sparkler’ were growing next to each other the previous year. Consolida – larkspur in a mix of colors is a joy for spiky accents in early summer. 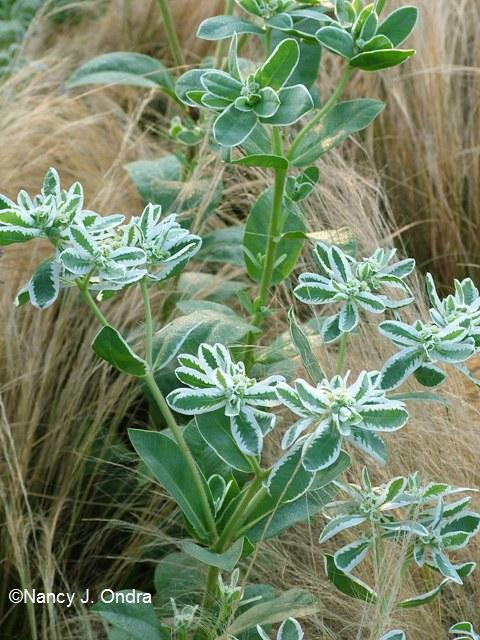 Euphorbia marginata (snow on the mountain). Yes, it can even be weedy, but the big seedlings are easy to spot and pull out where they’re too abundant. Helianthus annuus (sunflowers): in this case, a self-sown seedling of the stunningly variegated ‘Sunspots’, with some bonus seedlings of ‘Kingwood Gold’ jewels-of-Opar (Talinum paniculatum) at its feet. Lactuca sativa (lettuce): specifically, the marvelous ‘Merlot’, which, unlike most lettuces, looks lovely even when bolting into bloom. 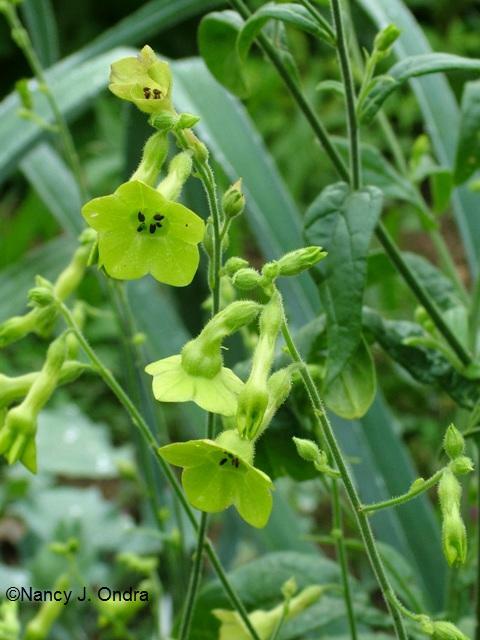 Nicotiana (flowering tobaccos). 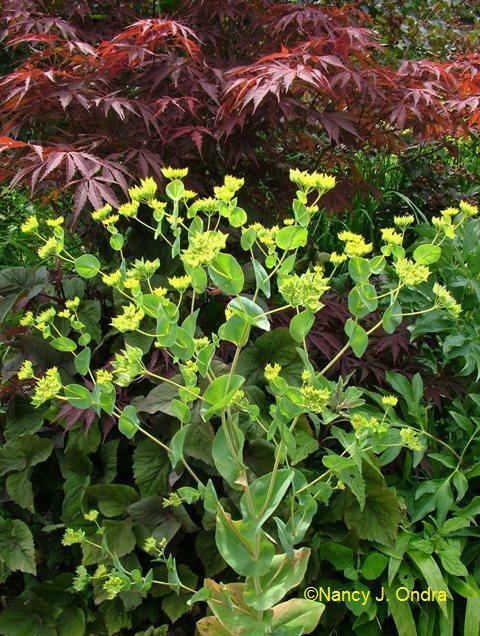 This one is the hybrid ‘Ondra’s Green Mix’; others are excellent self-sowers too. Nigella damascena (love-in-a-mist). 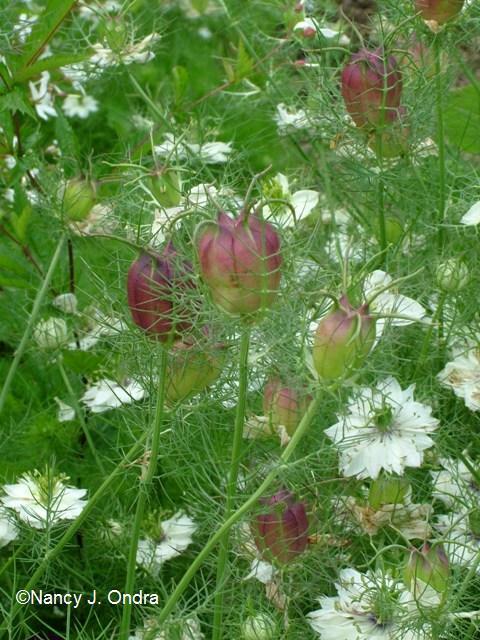 A fantastic filler, self-sown love-in-a-mist is always superior to transplants. This one, with white flowers and purple pods, is ‘Cramer’s Plum’. 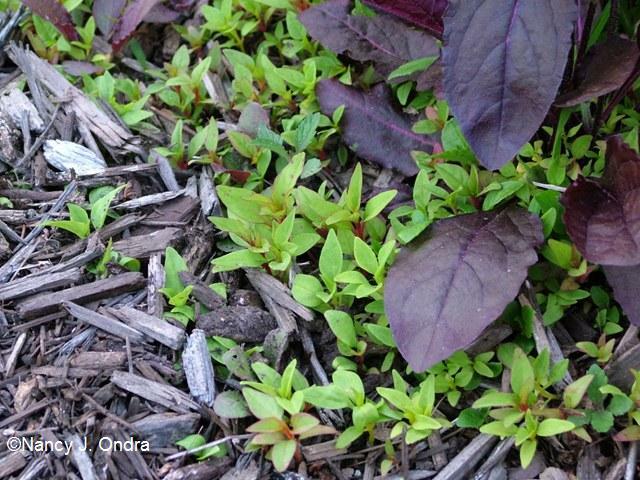 Persicaria capitata (formerly Polygonum capitatum), making an ultra-cute groundcover. 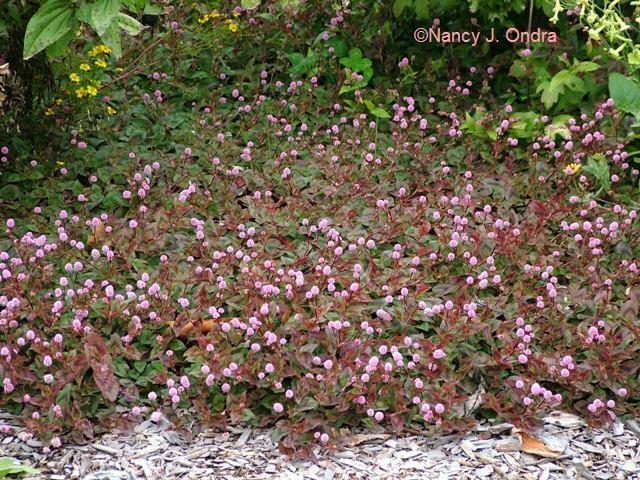 Persicaria orientalis (Polygonatum orientale) ‘Shiro-gane Nishiki’, variegated kiss-me-over-the-garden-gate, which, at eventually 6-feet-plus, is anything but a ground cover. And finally, Verbena bonariensis (Brazilian vervain). Yeah, I know this one can get out of hand, but it sure is a nice mingler. Ok, that was 12 plants, not 10. But with self-sowers, it’s all about getting a little extra! 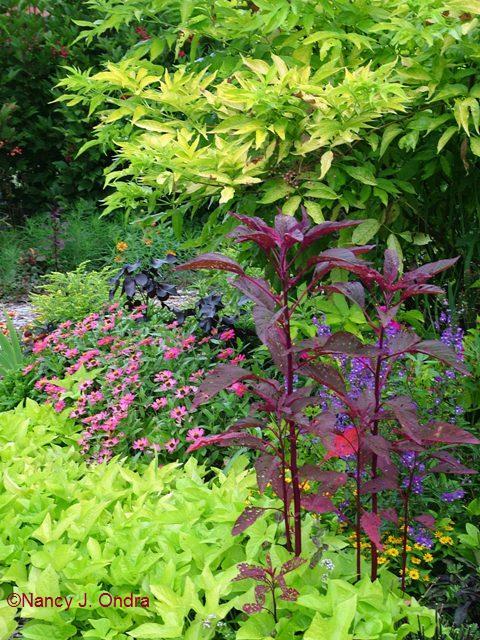 Thanks for the list, it really open my eyes to pay attention on self-sowing annuals plants, I used to think perennials are my only choice for a low-maintenance garden. I’m glad you found it of interest. As with all maintenance, it depends on what sorts of things you do and don’t like to do. If your space or time is too limited to start seeds indoors, and if you don’t mind editing out the unneeded volunteers, the self-sowing annuals really can be major time-savers. 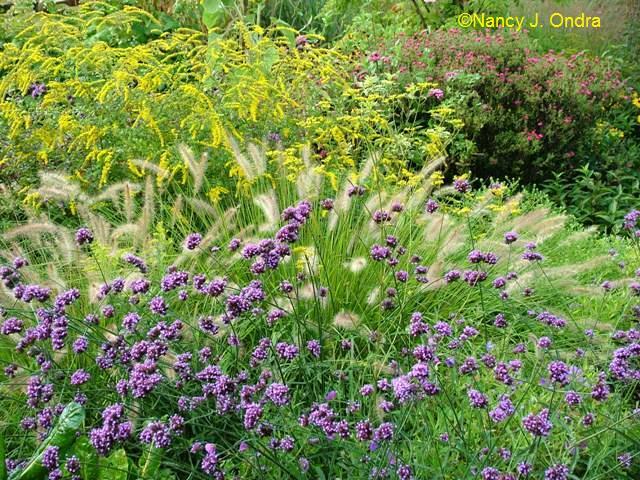 But if you hate “weeding” and prefer more control over where your plants are, you may think otherwise. I really like annual self-sowers too. I planted Sweet Alyssum over 10 years ago. It’s been with me ever since, to the point where it functions like a perennial. 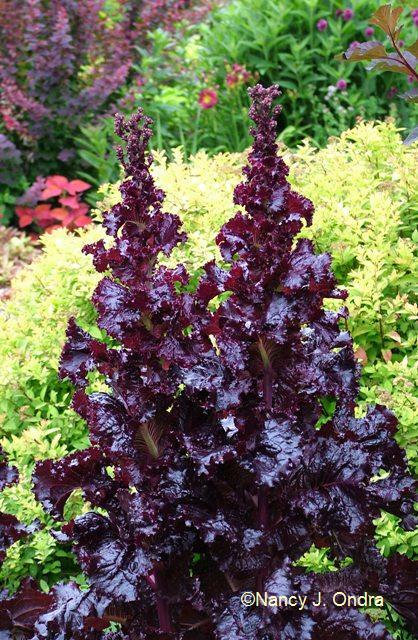 I planted for the first time this year Larkspur and the ‘Merlot’ lettuce. I’m so glad you posted the photo of the bolted lettuce. I was preparing to rip mine out before it bolted. Now I’ll leave it. Ooh, thanks for the reminder about sweet alyssum. That’s one that I’ve always struggled with to get going, so I haven’t planted it for years. I think it’s time to try again! I love (most of) the self-sowers, too, Nan, both for the surprise of where they’ll turn up and the added color. 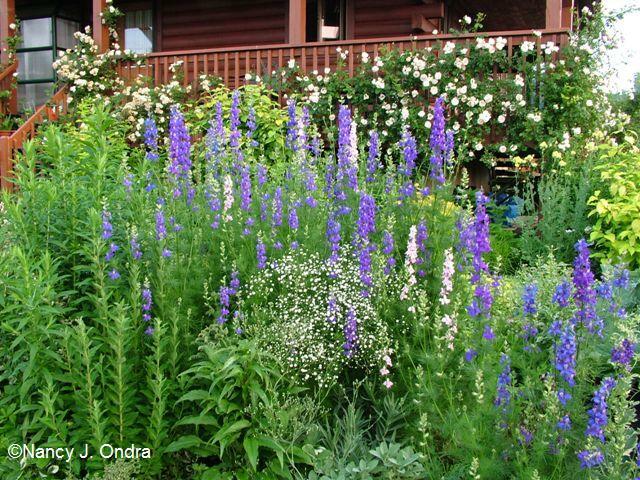 Larkspur and Verbena bonariensis are both huge favorites, but I’ve never managed to get them to self-sow here. (Sigh. Try, try again.) 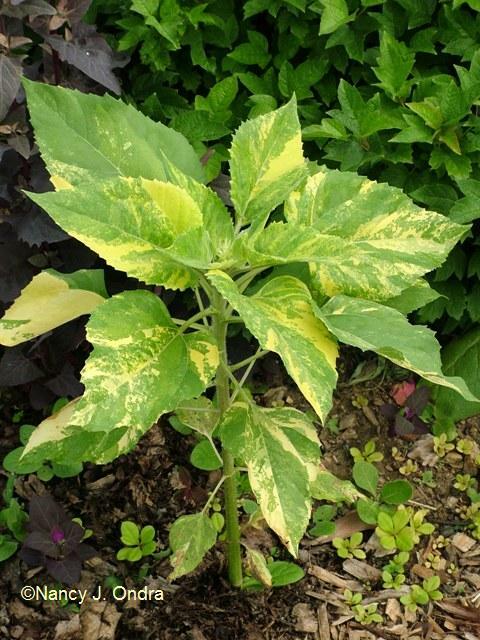 And that variegated sunflower is amazing! I guess you’re rather too shady for the larkspur and verbena, but I’m sure you have some other beauties. Yes, isn’t that sunflower great. It really saves time not having to sow them indoors and then rogue out the green ones. And the stems of the self-sown ones are always much sturdier. I agree that it is such fun (and cost effective) to find self sown annuals in the garden. I love it when the salvias self sow. I have even found petunias self seeding themselves around. 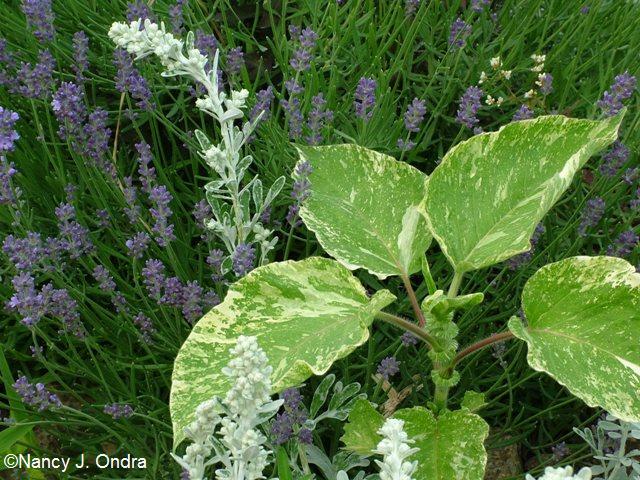 Yikes – I didn’t even mention the salvias! S. coccinea ‘Lady in Red’ and ‘Coral Nymph’ also belong in my top-10 (or now, top-13) list. And yep, it’s neat to find unexpected volunteers too. I’m finding that ‘Sweet Caroline Purple’ sweet potato vine gives me a few seedlings each year, which continues to surprise me. Over the years, I have learned to not mess with Mother Nature when it comes to most self-sowers. She seems to be infallible as to placement. I’ve had little luck with getting the verbena bonarienses to self-sow in my long border (though it seems to have managed to do so beautifully in other places — such as right next to my driveway, where I had unloaded some plants from the car a couple of years back, then left them there for awhile). I have three flats of said verbena waiting to go into the garden this year (what can I say, I’m behing times in getting things planted . . .), so maybe going forward I’ll have better luck. Do you have a source for the jewels of opar? I’ve had to resort to buying plants the last couple of years, being unable to find seed in intermittant searches on the Web. If I could just get them to produce seedlings . . .
That’s a great story about the verbenas, Nancy. I really ought to look around for the talinum seedlings; they should appear soon, if they’re not up already. If they return and bloom, I’ll be happy to send you some seeds; remind me in the fall. I think they usually appear in the HPS/MAG Seed Exchange too. Yippee for you -I like to keep my annuals, including edible greens, to see the entire life cycle-blooms, pods, seeds falling and providing food for wildlife. Love your list and will try to see what I can incorporate. I live on a small island where plants are horrendously expensive and the “soil” is limestone and sand. Self sown plants for me rare and are so welcome, as they save me money (or rather they are like free money). If something plants itself where it not suitable I just relocate it. Right now I have tomatoes growing in my bottle palms! LOL. Like you, I also love the combos nature can come up with: a friend has a royal palm about 60 foot high in his backyard in Trinidad that was obviously “planted” by a bird! Of course volunteer plants are strongest because they are selected-via survival of the fittest. I am always amused when I read on blogs/articles about the “horror” of self sowing plants and it all seems like there is a desire to “control” nature rather than live in harmony. Sometime people carry on about the “invasiveness” of something ( like cypress vine) that takes a few seconds to uproot. On a similar note, I was taken aback when I first read of “trash trees”. Trees don’t create trash, they drop leaves, flowers and pods which break down into the soil to enrich and regenerate it. This is part of the natural cycle of plant life. Fine of course if your yard is not conducive to a tree that does this, but don’t refer to such a tree disrespectfully as a “trash tree” or “litter tree”. Tomatoes in your palm trees? That must really be a sight! Actually, tomatoes self-sow even up here. I appreciate your comments about “trash trees”; I hadn’t before thought about them from your perspective, but you do raise some good points. Thanks, Nicole! The only self-sewing annuals I’ve got growing are larkspur. Clearly I need to branch out a little! They’re really the *only* annuals that self-sow for you? Maybe you’re a little too meticulous at weeding, Cynthia! Try being a little untidier, and I bet you’ll find more. When I first started my garden over ten years ago I planted some sunflowers. I have never had to plant them since! I just have move them where I want them each spring. I also have had petunias, cilantro, leeks, lettuce, garlic, tomatoes, catchfly, annual rudbeckia, Zebrina malva, and marigolds self seed. I even count on some of my short-lived perennials to self-sow to keep their beds filled — like gaillardia, lychnis, columbine, candy lily, coreopsis, rudbeckia, and feverfew. I don’t have a problem with any flower or vegetable that self sows as long as it is easy to pull out! I’m with you, Sylvana. Without self-sowers, I’d be broke (or have much smaller gardens). How cool that you have leeks self-sow! I love the second-year flowers, but my leeks usually rot over the winter, so I don’t often get the flowers, let alone volunteer seedlings. I love almost every plant you mentioned, and I don’t know what I would do without self-sowers and aggressive spreaders. Love em. Yep, depending on the size of the garden, a little aggression can be a good thing (in plants, anyway). This is a great list to have. I wonder if you have comments on what self-sowing plants say about a gardener’s climate, soil, and garden house-keeping. I wonder, for example, whether too much mulch or hand-tilling encourages or discourages success of self-seeders. I enjoy seeing what plants are thriving and/or adapting to my location, but I do know other gardeners like to start with a clean slate each spring so as to show off their own design skills. Some of these seed must be long-lived as well. I purchased my aunt’s house many years after she passed away, and many years after she had last planted anything. There were no flower, just weeds in the beds. After turning the soil the first year I had the place, I was surprised–and delighted–to recognize little plants of Nigella damascena emerging. They still are there every year, and something like a living legacy of someone long gone. She had planted these sometime in the 1980s I think, but they re-emerged when conditions were right. Sorry for the delay in answering, Dan; I’ve been thinking about your questions. I was going to make a comment about self-sowing being a sign of a relaxed gardener – one who didn’t worry much about immediately deadheading everything. But then I realized that most of my annuals sef-sow sneakily, dropping much of their seed before I even realize it’s ripe, and at a point when the plant looks its best. I don’t find mulch in general to cut down on seedlings; in fact, I find the vast majority of volunteers in my bark-mulch paths. But it does make a difference when I add a fresh layer of mulch in early spring, really cutting down on the seed germination. I’ve almost lost a few things that way. I’ve also found that it helps to delay spring weeding a bit, so it’s easier to tell the good stuff from the weeds. Thanks for sharing the story about your aunt’s garden. What a lovely reminder you have of her. I must find some of that ‘Merlot’ lettuce, by the way. I knew it was pretty, but didn’t realize it was so good-looking while going to seed! In a similar vein, one of my good self-sowers is “Ruby Orach” mountain spinach… hard to get upset about a plant where you can eat the seedlings you have to weed out, isn’t it?! Oh, Kim – how could I have forgotten about the orach? It’s another one of my top favorites, right up there with the amaranth. I’ll have to admit that I’ve never tried eating the excess seedlings; maybe next spring!